How To Fake Tan Like A Pro! Of course! ……Whether you choose to have your favourite spray tan therapist spray you or you do it yourself everyone loves to look tanned & bronzed. 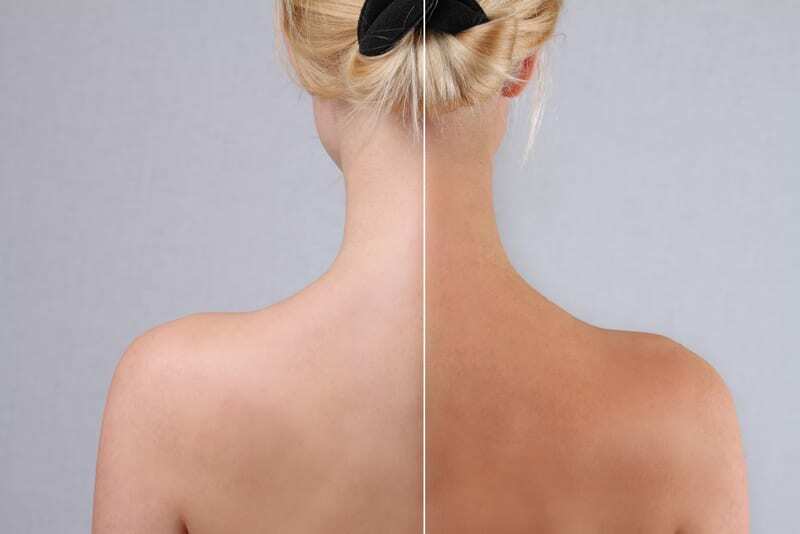 An essential part of the tanning process is to achieve an even long-lasting tan you need to have removed the dead skin cells as the main ingredient DHA (Dihydroxyacetone) in faux tan clings to dead/dry skin causing it to go orange! Yuk! Nouvatan don’t suggest you buy expensive exfoliation products as exfoliation is something you can achieve naturally with just an exfoliation mitt and a mild, not heavily moisturising shower gel/crème. Some products like Dove can leave a residue that can hinder the development of the tan. 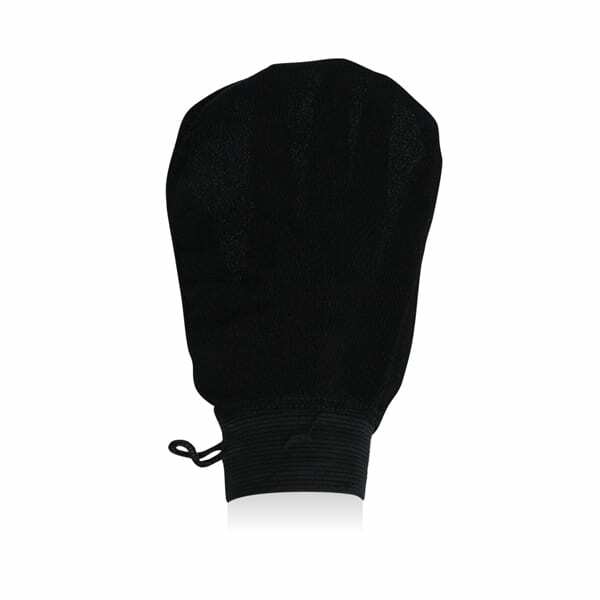 Just wet mitt, apply product and with circular motions gently scrub you skin all over your body. Rinse thoroughly and towel dry. Make sure to always tie your hair completely back when tanning. Use anything that will pull the hair away from the face, ensuring the hairline can be seen. We like an Alice Band especially the plastic ones that can wipe clean after use. If you have long hair tie this back with a butterfly clip or scrunchie. As mentioned above with exfoliation, DHA sticks to dry areas such as hands, feet, elbows and knees. To avoid apply barrier cream all around the hands like a hand cream application. This will also prevent the tell-tale signs of a bad spray tan on the fingers where you can see the lines. If you suffer with Psoriasis, eczema or any other conditions you can still tan but always apply barrier cream to the affected area. We don’t recommend you tan were the skin is broken. Nouvaglow intense – (8% DHA) The darkest gradual tan on the market. Just apply with you hands over the body and face and remember to WASH THOSE HANDS AFTER. Nouvatan Self-Tan Mousse – This fantastic easy to apply mousse, again available in light or dark, can be very easily applied following the rules above on barrier cream. Just apply a 50p piece amount of product on an application mitt and off you go all over your body and face. As this is a mousse, it is non-streaky and quick drying. Wait about 10mins before you dress and 4-6 hours to wash off for the full development colour. Nouvatan Tan in a Can – This is a spray which can be applied either directly on to the skin and rubbed in with Application Mitt or as we prefer, spray onto the applicator mitt and then apply to your skin as its more controlled this way. It is important to not to moisturise your skin before applying faux tan as this can act as a barrier. However, it is key to keep your skin hydrated after your tan especially if you have opted for a darker tan. So, once you have washed off the guide colour and patted you skin dry with a towel. Use an Oil Free Moisturiser whenever possible as mineral oiled products have a tendency to strip a tan. Same goes for your SPF Sun Cream. Choose a milk rather than a thicker oily spray or lotion.